Ryan Murphy signed a huge deal with Netflix, and the first results of that deal will soon be upon us. The Politician, which Murphy co-created with Brad Falchuk, and Ian Brennan, follows the political aspirations of a wealthy Santa Barbarian. The ambitious concept for the show will have each season dealing with a different type of political race the main character is dealing with. First up: Student Body President at his high school. 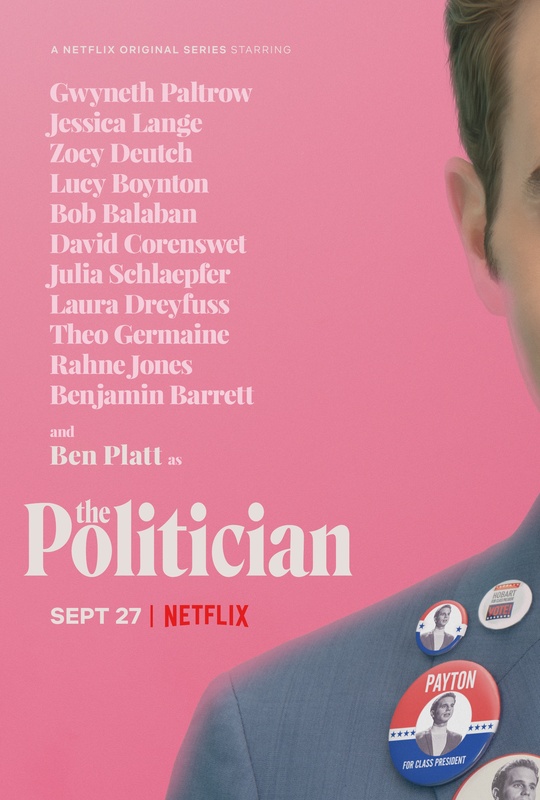 The Politician premiere date has been officially announced by Netflix, along with the full cast. Above you can see the first poster for The Politician, the first Netflix show from Ryan Murphy. Murphy has been entrenched at FX for the last few years, but in 2018 he signed a huge, multi-year deal with Netflix. According to The New York Times, the Ryan Murphy Netflix deal could have been worth as much as $300 million, making it one of the largest deals ever made for a TV producer. Payton Hobart (Ben Platt), a wealthy student from Santa Barbara, California, has known since age seven that he’s going to be President of the United States. But first he’ll have to navigate the most treacherous political landscape of all: Saint Sebastian High School. To get elected Student Body President, secure a spot at Harvard, and stay on his singular path to success, Payton will have to outsmart his ruthless classmates without sacrificing his own morality and carefully crafted image. Full of dark comedy and sly satire, Ryan Murphy’s The Politician offers a rare glimpse into just what it takes to make a politician. When the show was first announced, Deadline reported “every season will revolve around a different political race his character is involved in.” I assume that means the show’s final season will culminate with Payton finally running for President of the United States. Deadline also said that Platt will have musical numbers in several episodes, which makes sense – the actor and singer has appeared in musicals like The Book of Mormon and Dear Evan Hansen. At one point, Barbara Streisand was in negotiations to appear in the series as well. Her name isn’t among the cast list, so that deal either fell through, or Murphy and company are trying to keep it a big secret. The Politician debuts on Netflix September 27, 2019. The post ‘The Politician’, Ryan Murphy’s Netflix Show, Announces Cast and Premiere Date appeared first on /Film.